woman diagnosed in her thirties. 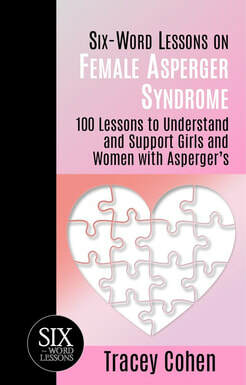 Endorsed by leading Asperger syndrome expert, Dr. Tony Attwood, Six-Word Lessons on Female Asperger Syndrome gives you 100 honest, pointed lessons written by a woman with Asperger syndrome. Under the radar well into her thirties, the author illustrates little-known behavioral differences indicative of male and female Asperger syndrome, early signs for detection, coping strategies, diagnosis and more. Created for individuals, families and professionals alike, readers will come away inspired and reassured having gained practical knowledge to understand and enable successful aspie living in our complex neurotypical dominated world. Written by Tracey Cohen, a lifelong competitive runner, freelance writer, and Returned Peace Corps Volunteer, who was diagnosed with Asperger syndrome at the age of thirty-nine. Sharing her own struggles and discoveries, she aims to empower others to learn, accept and find peace in an ever complicated neurotypical world. Tracey lives in Farmington Hills, Michigan with her treasured Labrador Retriever, Bailey Kennedy. 2. Why are Females Missed in Diagnosis? Short enough to read in a day, but full of a wealth of valuable information for anyone who is either a female with autism or Asperger's, or has someone in their life they would like to understand and support in a greater capacity.